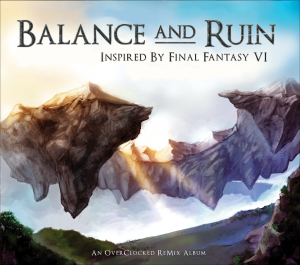 The public interest in OverClocked ReMix’s Balance and Ruin skyrocketed back in 2012, when the album took to Kickstarter to license and print physical copies of the album, far exceeding its goal. Boasting five discs, the album covers all of the tracks of Final Fantasy VI in order, with a bonus disc for extra remixes and bonus content for those with physical copies. Directed by Final Fantasy VII: Voices of the Lifestream‘s Andrew Aversa (aka zircon), the album boasts the involvement of over 50 arrangers and numerous performers, many of them popular names such as Danny Baranowsky and Jake Kaufman. Many styles and genres are covered in this album project, although since songs are not grouped by style but placed by order of their original tracks, there is not much in the way of flow. However, this does little to bring down the allure of the album, which as it turns out is a collection of high quality remixes that at times goes far above and beyond the typical fan-remix project fare. The album naturally comes with its share of rock and metal covers. While most are fine and feel rather typical of the genre, a few do their best to stand out. The battle theme gets a 10+ minute remix in “Polemos” with a number of elements that bring exciting solos and variations throughout its length. “Train Suplex (Decisive Battle)” is more synth heavy, but still retains its epic feel, courtesy of Super Meat Boy‘s Danny Baranowsky. It’s a wonderful way to expand on Nobuo Uematsu’s vision for the original. Then there are the four lengthy movements of “Omen”, on the bonus fifth disc of the album, which expand on the opening theme as well as the battle theme into a rock symphony of sorts. Generally the tracks chosen lend themselves well to the genre, and there is a good balance between these tracks and the others. The album includes many electronic remixes, and these offerings feature many dubstep influences. This may be a bit tiring to some, but great tracks like “13th Floor Demonstration (Magic House)” ensure listeners that these remixers know what they are doing. A good number of remixes incorporate other styles and elements with the dubstep to keep things interesting. An example is “Savage Triumph (Wild West)” , a collaboration of three arrangers that mixes rock and electronic elements. “Meditations on an Apocalypse (Catastrophe)” and “The 6th Kingdom (Terra)” (the latter by Jovette Rivera, a well-known producer!) take advantage of Asian instruments, giving flair to the excitement of the pieces. There are a few electronic songs without the dubstep influence, such as the light and relaxing “Pure Essence (Relm)” by José the Bronx Rican, the ethereal “Smoke and Clouds (Locke)” by Jeff Ball, and the techno “Full Speed Ahead (Setzer)” by Andrew Aversa. 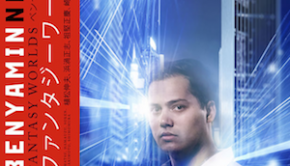 Impressively, the many electronic remixes on the album cover a lot of genres, and should not get tiring throughout. A little less common are orchestral tracks. In most fan projects these tracks have some good ideas but lack in execution since they are unable to be performed with a real orchestra. 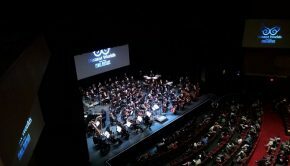 The album is fortunate the have the epic “Terra’s Resolve (Terra)”, arranged and orchestrated by Symphony of the Goddess‘ Chad Seiter, actually played by the 120-piece Slovak National Symphony Orchestra. The beloved theme gets a great orchestral arrangement infused with emotion that succeeds at describing Terra’s story and conflict. Although other similarly style tracks do not get the same treatment, the remixers generally know their way around the synthetic sounds, and often sound like the real deal. Some incorporate some acoustic instruments for greater effect. “Prologue (Opening Theme)” sounds like it would be used to open an HD remaster of the game, with a convincing cinematic sound developed by Star Wars: The Old Republic‘s Wilbert Roget. Tracks like “Ascension of a Madman (Kefka)”, “Castles in the Sand (Edgar and Sabin)”, and “Katabasis (Epitaph)” are also of high quality, even bringing out what might have been the original intentions of the pieces. A number of acoustic tracks are on the album, some instrumental solos and some small ensembles. These remixes are mostly very good in quality and arrangement, and the performances are great. “Idle City Streets (Kids Run Through The City)” is a beautiful warm guitar solo. The piano solos of “Jhidorian Rhapsody (The Wedding)” and “Gestahlian Sonata (The Empire ‘Gestahl’)” are both dramatic expansions and interpretations of their source materials. “A Simple Flip Can Change Fate (Coin Song)” really captures the emotional weight of the original song with some guitars and other instruments. “A Tranquil Rest (Rest in Peace)” has beautiful violin and viola duo play over some light piano atmospheric background in a manner that is sure to transport listeners to the most beautiful places in their imagination. Then there is the “Ending Suite (Ending Theme)” which intimately goes through all of the major themes of the soundtrack with just a piano and violin. Great work all around in the acoustic remixes of the album that tie together the creation. A few notable tracks are much more interpretative taking on genres not always seen on remix albums, and many of these also feature small live ensembles. “La Montaña de los Caballos Jóvenes (Mt. Koltz)” is a joyously fun flamenco with many different building elements slowly added into the fray. XPRTNovice’s set of remixes (including “A Fistful of Nickels (Shadow)” and the insanely fun “Gobble, Snarf, Snap (Phantom Train)”) all feature a small ensemble and arrangements that are playful and full of character, often caravan styled. Some electronic noir jazz makes it on the album with Mazedude’s “Slam Shuffle (Grand Slam)”. 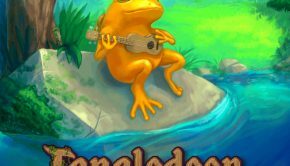 “river of sine waves (The Serpent Trench)” mixes together bossa with chiptune elements into a charming package, and “Umaro’s New Groove (Umaro)” presents a cartoon-styled soundtrack to retell the character’s story. All of these offerings are fresh and well-executed, livening the album and giving it even more variety. Last to be spoken of are the vocal tracks of the album, which are also not often seen on remix albums. These remixes cover many styles, from the mellow electronic “On the Run (Returners)”, the dreamy “Tastes Like Victory (Fanfare)”, or the latin jazz “Blackjack’s Breakup Bossa (Blackjack)”. The vocals are generally quite good on these, and a special nod goes to the vocalist of the Bossa who does a great job at capturing the particular style of singing appropriate for the track. The centrepiece of these vocal tracks is of course the fantastic three track take on the famous opera scene from the game. “Overture”, “Opera Sequence” and “Aria de Mezzo Caraterre” all are handled by a different group of arrangers, namely scene veterans Andrew Luers, Jake Kaufman, and Andrew Aversa, and each is a great interpretative take. 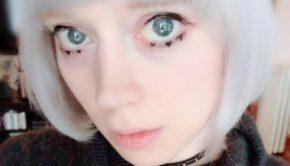 “The Impressario (Opera Sequence)” is a Queen-influenced rock remix with tight harmonies and several differently styled sections, and the aria has a light and airy electronic accompaniment to go with Jillian Aversa’s ethereal vocals. 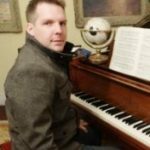 New lyrics are written for all of these vocal pieces, and they all work with the new arrangements that the songs receive. Although the album often jumps genres rather sharply, the sheer variety of tracks and the high quality standard of the album is impressive. Every idea is well fleshed out, and even some of the tracks that were less notable on the original soundtrack can stand out here. The rock and metal tracks are good, and the electronic offerings do their best to incorporate interesting elements and surprises. The orchestral and acoustic arrangements are emotion infused interpretations of the source material, really bringing them to life. Then there are the more interpretative tracks with some Latin and Asian flavours that bring freshness to the album. Few tracks (if any) can really be considered duds, but they may simply fall behind the more impressive workings of this large project. There is certainly something here for everyone, and this remix project really does the original soundtrack justice. With this, the team behind Balance and Ruin have an album that they can be truly proud of. Posted on September 7, 2014 by Christopher Huynh. Last modified on September 12, 2014. This was one of the first video game soundtracks I ever bought – so happy to finally have this album!! Great review indeed! Very tempted to get this one… One of my first game score albums too, lots of very fond memories.